The Golden State Warriors will look to pick up another road win against the Denver Nuggets on Monday night. Every single time a test has been put in the way of the Golden State Warriors this season, they have passed it. 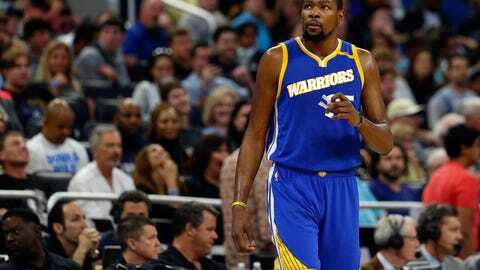 On their current road trip, the Warriors have defeated two Western Conference playoff teams, as they knocked off the Memphis Grizzlies and Oklahoma City Thunder. On Monday night, they get the team in the eighth seed currently, the Denver Nuggets. The game will air locally on CSN Bay Area and it will also have a live stream option via the NBA League Pass. That will be available to folks that are out of market. Here’s all the information you will need as the Warriors shoot for their next win on Monday night. Denver pulled off a deal to acquire Mason Plumlee on Sunday. While they have Nikola Jokic already, the Nuggets feel the two can play together in the system they want and be successful with it. Golden State likely could face Denver in the first round of the playoffs. While Portland is still chasing the Nuggets, the move from Denver seems like they’re going all in on making the postseason with their young roster. These two teams tend to have some classic battles in Denver, and Monday night could be another. The Warriors will be without shooting guard Klay Thompson and Shaun Livingston. That means Draymond Green, Kevin Durant and Stephen Curry will need to have a big night. With just a couple of games to go until the All-Star Break, the Warriors will aim to push hard to grab two wins before they get some rest. Although the four stars are going to New Orleans, the time off will do everyone some good. The addition of Briante Weber has proven to be a valuable one thus far. In limited minutes, the guard has shown why Golden State has picked him up for extra depth. With two guards out on Monday, it’s likely he will see more action on the floor.